In modern society, computer is an important part in our life. Either desktop or laptop, most people will touch computer everyday. Security is an important thing when using computer. When talking about security, users will think of backup software. Yes, backup program is necessary, a full scale backup freeware can backup your data and system, even has clone features and other utilities. However, as modern society is fast-tempo society, people usually has not enough time to do every kinds of backup task. But system backup can’t be eliminated. Thus, one click backup tool comes! AOMEI OneKey Recovery is such a one. As we know, many brand computers especially laptops have built-in one key backup programs. But they often have limitations. For example, when you resize the system partition or reinstall the system, the inbuilt one key backup program may be disabled. AOMEI OneKey Recovery as a third-party one key backup&recovery software, these won’t be happened. It can work well on both desktop and laptop. Left is backup, right is recovery. By the way, the latest version of AOMEI OneKey Recovery 1.6 has free and paid editions. For common people, free edition is enough, which only supports Windows PC. When you choosing free edition, you can only backup to factory partition, you have no other choices. It is a real one click to backup. 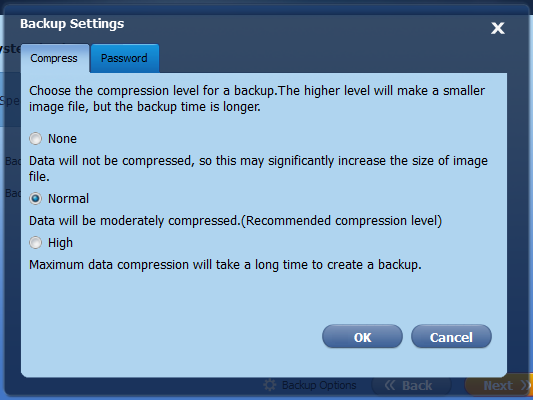 If you choose paid edition, you can backup system to other location, choose the compression level of backup and enable encryption for backup and other options. To restore, please press “F11” (default) or “A” key during system startup. Paid editions allows you to restore system from local disk or external disk and select an image file to restore, and even can set prompt time interval during startup manually. There are four paid editions to meet different users’ demands. If you want to enjoy all functions of AOMEI OneKey Recovery, please try Professional Edition. If you run Windows Server operating systems, please try Premium Edition. If you would like to install it on unlimited PCs, please choose Technician edition. If you want to customize UI & logo, rebrand for OEM installs and provide charged technical service, AOMEI OneKey Recovery Customization Edition suits for you. AOMEI OneKey Recovery saves you time. It is a great tool for lazy man. If you are looking for PC backup software and functions such as file sync, please try AOMEI Backupper, we have article about it too.